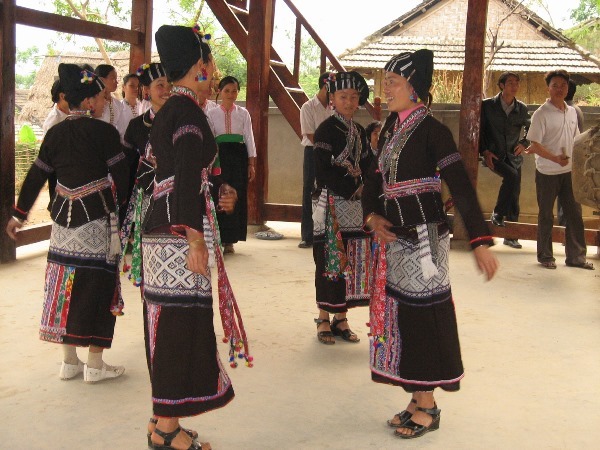 With a population of about 1,200,000 inhabitants, the Tay is the largest group in the community of ethnic minorities in Vietnam. Tay language belongs to the Tay-Thai Group. The Tay have other names such as Tho, Ngan, Phen, Thu Lao and Pa Di. The Tay inhabit along the valleys and lower slopes of mountains in Cao Bang, Lang Son. 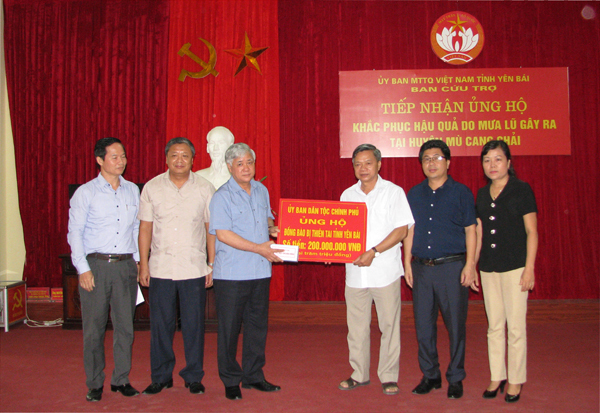 Bac Thai, Quang Ninh provinces and in some regions of Ha Bac province. 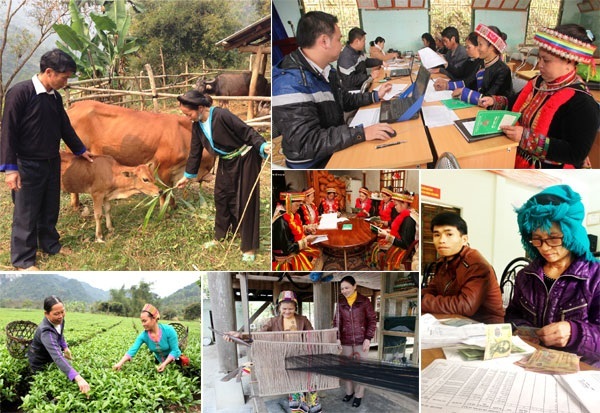 The Tay preserve a traditional and fairly developed agriculture with a cultivation of all kinds of plants including rice, maize, sweet potato, etc.and seasonable fruit and vegetables. The Tay villages are always set up at the foot of a mountain or along a stream and are named after a mountain, a field or a river. Each village contains about 15-20 households. A large village is divided into many small hamlets. The houses are built on stilts or level with the ground. The houses in frontier region are called ''defense houses" which are often protected against interlopers by a stone wall along with a ditch. The interior is divided into two rooms, the front one reserves for men and the rear one serves as women's bedroom. The Tay clothes are generally dyed with indigo. Women wear a below knee-length dress split at the right side up to the armpit with five buttons and narrow sleeves. The Tay prefer sons to daughters. Prescriptions in relationship between members of the family are obviously dictated. The couples live in harmony. Divorce is rare. Matrilocate is no longer observed. Ancestor worship is the regilious rite of the Tay. The ancestor altar is placed in a central and grand place of the house. Strange guests are not allowed to sit on the bed in front of the altar. Moreover, they ought to refrain from stepping on a fired firewood in the kitchener or on the later's side. Those who are back from a funeral ceremony abstain from watching cattle and poultry if they have not taken a bath. After giving birth, the women are not permitted to come near the ancestor altar. 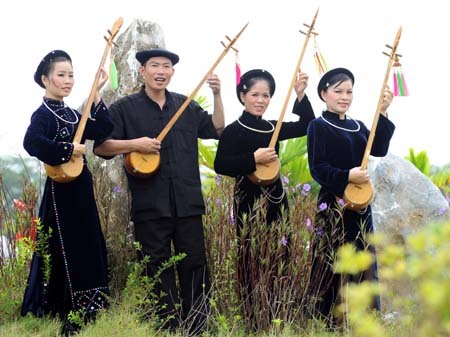 The Tay possess a rich traditional folklore with all kinds of poems. songs, dances and music. Proverbs and folksongs are numerous. Tay folksongs have the turn (a kind of duet between lovers). wedding songs and lullabies. The Tay are hospitable, open-familiar and talktive. They have respect for the same-aged people. Once they have fraternized with other persons-they consider the laters their next of kin.